On the range with a practice bigfoot. 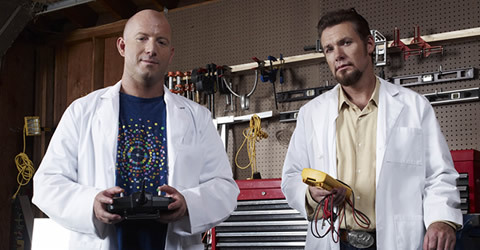 A new TV Show on the History Channel called Invention USA follows Reichart Von Wolfsheild and Garrett Lisi as they go in search of the next breakthrough invention. Reichart and Garrett put prototypes to the test and give a tough, no-nonsense evaluation of each invention's potential. In the premier episode they are contacted by Jim Lebus who invented a fireball Gun, more specifically incendiary paintballs, to protect himself after an encounter he describes below. "Its a deterrent for a situation out in the woods. A couple of years ago I was in northern California... I was attacked by an animal and I was in my tent. I see this shadow go past the moon. So this tells me this thing is, like, 8 feet tall. And whatever it was, was pushing me into the ground...I'm assuming it was a Bigfoot. I had a .38 with me, but you can't just start popping off rounds. If you gonna cap Bigfoot your just gonna piss it off"
Of course, the first question he was asked by the hosts was a shot to his credibility. Jim was questioned if he was drinking that night, he quickly replied, "No, I was stone sober." He also was asked if he had ruled out a bear, and Jim said he had not, "...but the only thing it took was the spices." Below is a video Jim has uploaded to YouTube. There are way too many of these warmonger wannabes out there, short on information, common sense and courage. The chances of their bringing a barbecued sasquatch back: Just about zero. The chances of their starting a raging forest fire: Very high! The chances of their getting totally panicked and shooting each other or an innocent bystander: Also very high! Thanks for the comment Darrellvmc. We wonder how someone like Jim Lebus can be so confident in an endeavor that has been elusive for so many. Encounters are rare, multiple encounters are even more rare. Those who do have multiple encounters usually claim they felt that the bigfoot chose them. There is something more going on here. Bigfootevidence has been really pushing this guy and building him up. This is the same website that announced Dr. John Bindernagel chose their website to give his thoughts on the Erickson Project. By the end of the day everyone who ever talked about Bigfoot had commented on BigfootEvidence- then came the story on LeBus. The same time the show was set to air on the history channel. A good friend in Arizona told me this and it sure looks like Shawn over at BigfootEvidence made up all those quotes so people would start coming to his website- where he was plugging LeBus right when he was going to be on the history channel. LeBus did not even have a Youtube Account before three days ago he created it like a day before all the Shawnanegins started at BigfootEvidence.